Last night many of us had a unique opportunity to take part in a massive technology shift. For the first time in computer history, millions of users were nearly simultaneously jolted forward into a new era. When Apple released iOS 7 for mobile devices, including iPhones and iPads, whether we like it or not we entered the era of the digital native. Traditional computer systems have been based on a few principles from the physical world. The majority of computers still use a desktop as the basis of our digital workspace. We use file systems in much the same way we would use a physical file cabinet to store documents and data. Our photos are organized into albums. The original principles behind this were clear: during the transition from a physical workspace to a digital workspace, we needed mental anchors that we could relate to in the physical world to understand the digital. Our user interfaces, the front end of the software systems we interact with, have been based on this concept of the digital world reflecting the physical world since computers were born. As our reliance and comfort in the digital world has expanded, this reflection of the physical into the digital has become less and less relevant. We understand how to move in these environments because we have become so adapted to the functionality. 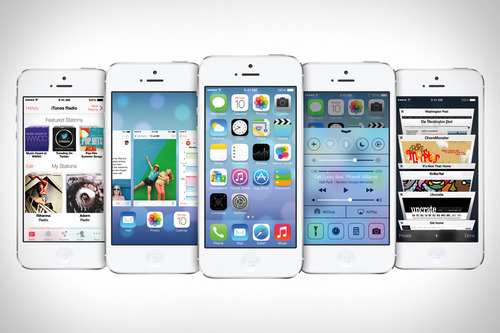 The new iOS 7 is an understanding that we can function without the old, physical metaphors. The icons are flat and no longer resemble physical buttons. The calendar uses an infinite scroll, rather than turning pages of a book. These changes permeate the design of the new operating system. It is little changes that we have been building toward since the creation of the desktop environment in the 1980’s. In the new digital native era, our task will be to design for digital in ways that were never possible in the physical world. We will see more applications embracing the idea of the infinite scroll, and we will experience fewer page turns. These subtle elements will continue to open up new ways of organizing and interacting with data, and will expand our horizons in the process. The landscape is now, more than ever, open to innovation that leaves our previous precepts behind. Yahoo! Changed its logo. Did anyone notice?